For the first time since Peer Instruction was developed in the 1990s, Mazur, a group of scholars from Asia and the Pacific, and Beijing Normal University are organizing a conference. Innovative educators from across the globe will connect, share, and learn about how to flip their class using this research-based method at an inaugural event this winter. 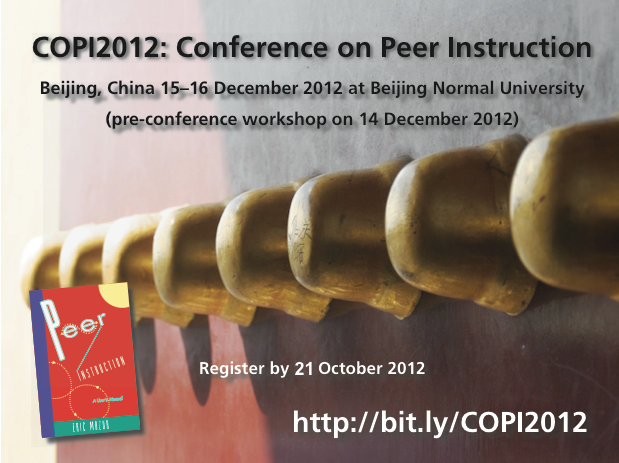 The conference will be held at Beijing Normal University from December 15-16, with a pre-conference workshop led by Eric Mazur on December 14, 2012. Hi there! I work for Avanti Learning Centres in India, a social enterprise that uses the Peer Instruction learning method to provide affordable education here in India. I was wondering if you could estimate how many schools use the PI method now, as of 2015? Checking into this. Will edit post as soon as I hear. Thanks for the question. Absolutely, the abstract and registration date has been moved back to 10/21, please go with that date.